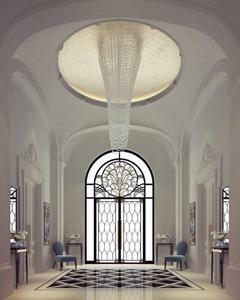 Walk through these glamorous neo classical lobby and behold how the over-sized window allows the natural light to creatively highlight the sleek White Calacatta marble flooring with Armani Gray, Light Emparador, Crema Marfil and Azul Blue crafted meticulously to form the geometrical illusion pattern. The gypsum decorated wall and the irregularly shape with embellished trim ceiling radiates royalty and luxurious feel of the interior. 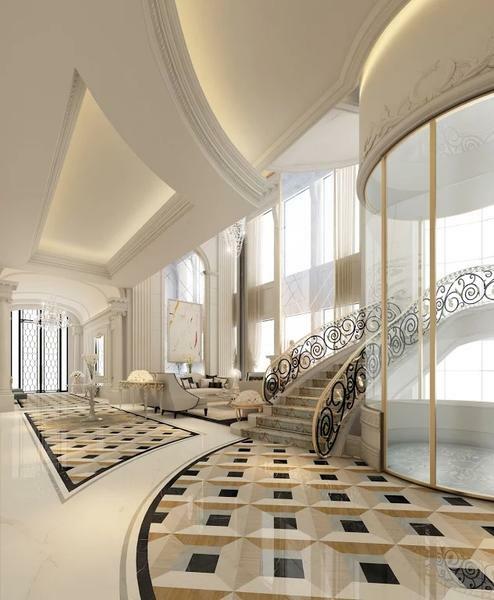 In the same way, the bespoke wrought-iron decorative staircase handrails in elegant black and gold complemented with a classical designed runner along with the curvilinear panoramic lift in brass frame contributes to an already astounding space. One cannot of course failed to notice those charming furniture in timeless design. The seats are upholstered in Sweet Thing Sparkle White fabric by Rubelli and augmented by extravagant consoles and tables. 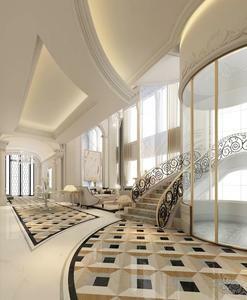 Design conceptualized for a private villa in Qatar.